August 2008: Here's one of the biggest things, potentially, to ever happen to the Judge Dredd Megazine: the irrepressible Tank Girl joins the lineup with all-new episodes. Helpfully, Meg # 275 features not only the first episode in a wild new series of Tank Girl by Alan Martin and her new artist, Rufus Dayglo, but also a new series of articles written by Ed Berridge about the history of British adult comics, which helps put the new story in some context. 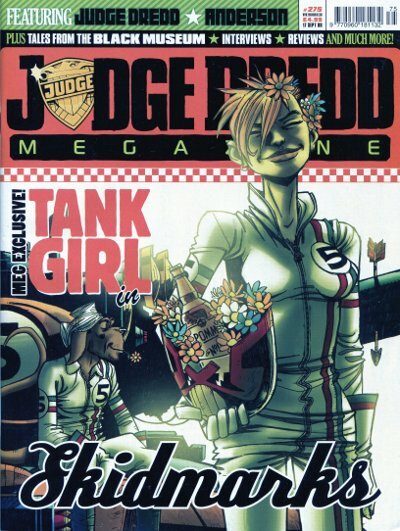 Tank Girl, as a strip, debuted in 1988 in the premiere issue of Deadline, although the character had been used in flybills and promotional tat for punk groups for a while before. The creation of Martin and artist Jamie Hewlett, she then became a regular player in the magazine. A heady mix of anarchic comics, left-wing politics and indie rock - one of Melody Maker's most celebrated writers, the late Steven Wells, contributed several features and interviews - Deadline is, decades on, an absolutely wild and occasionally impenetrable time capsule. It's much loved by those who were able to embrace it at the time, albeit somewhat baffling to those of us on this continent even if we were the right age to have loved it or the music that it championed. Tank Girl was the star player, and apparently the most regular feature - I have never seen a proper "database" like those that we trainspotter 2000 AD fans assembled - but other series, including Johnny Nemo by Peter Milligan and Brett Ewins, Wired World by Philip Bond, and Hugo Tate by Nick Abadzis are all well-remembered by many, although, if we're honest, I recall an article about the group Kitchens of Distinction written by "Swells" more clearly than any of the comics. Deadline didn't survive either homegrown indie rock's breaking into the mainstream in the mid-90s or Tank Girl's debut as a remarkably poor feature film. The movie was such a bust that the backlash helped sink the comic. The movie flopped in April of 1995 and Blur had their first number one with "Country House" in August. The moment had passed, and Martin and Hewlett granted DC's Vertigo imprint.a license to publish Tank Girl. They released some poorly-received comics written by Milligan and retired the character in early '96. Eleven years later, Tank Girl returned. Hewlett had, by this time, become a hugely successful multimedia artist, and regular collaborator with Blur's Damon Albarn, and gave Martin his blessing to continue without him. Now published by IDW, Martin hooked up with artist Ashley Wood for some mini-series adventures. 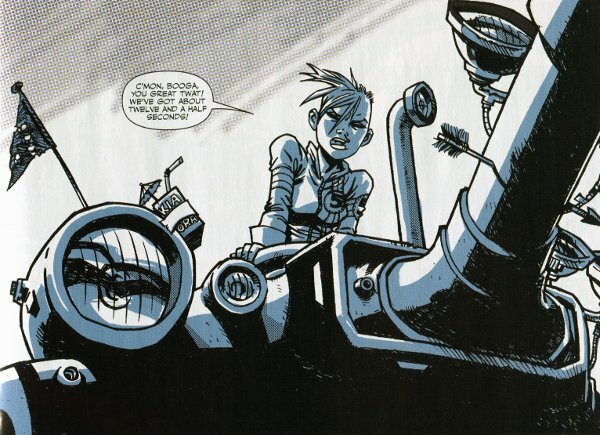 But Tank Girl works best when it regularly appears in a larger context, and in shorter bursts of material. So, while the IDW releases continued as occasional mini-series, Tank Girl began a residency in Judge Dredd Megazine unlike any seen before. With a couple of single-issue breaks, she was a regular player for almost two full years. It's difficult to say how much of Tank Girl's original success was down to Hewlett's art, but, while it may be unfair for everybody to downplay Martin's considerable, and ongoing, contribution, it's accurate to say that people do. I recall pointing out IDW's Ashley Wood-drawn Tank Girl to a group of comic-reading friends and acquaintances, and, without Hewlett, none of them were interested. True, Wood's stylized take on the character was a pretty radical departure, but conservative comic readers get their notions and hold onto them for dear life. Dayglo's version resembled Hewlett's a little more closely, and the shorter episodes, usually nine pages each month, more closely evoked the non-linear, anything-goes feel of the Deadline days. The new Tank Girl launched with a ten-part epic called "Skidmarks" that drew inspiration from the old Hanna-Barbera TV cartoon Wacky Races and the Burt Reynolds film The Cannonball Run. It's the most straightforward, and by far the longest, of Tanky's Meg adventures. Subsequent stories, which appeared through the spring of 2010, would be shorter, much looser, and also quite controversial among readers, but more of that down the line. 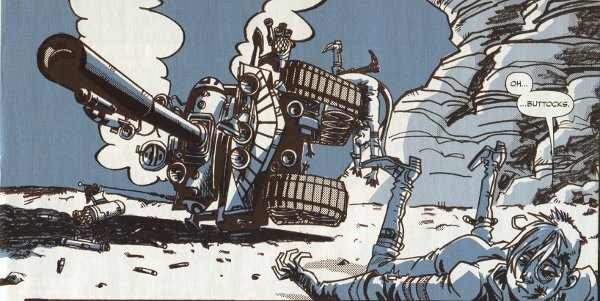 I recall being both very excited and very frustrated by the launch of Tank Girl in the Meg. I won't claim to have ever been a fan of the character, though I really appreciate the nice way that Titan repackaged their series of reprint books at the same dimensions as Rebellion's line, which was very thoughtful of them. I think I'm too linear (and boring) of a reader for most of the carefree and bizarre Deadline material, no matter how much I love, for example, Philip Bond's artwork. (I would certainly like to see a Wired World collected edition prove me wrong, though.) Since I did love Rufus Dayglo's artwork, and saw such sales promise in Tanky joining the Meg, I was cautiously optimistic. But I was incredibly disappointed when, again, Rebellion failed to capitalize on their newest star by, you know, promoting the living heck out of her. The IDW books were selling to some small audience in the States. Even if my anecdotes suggested some resistance, the books still moved, but, as 2008 ended and I began a lengthy look, incorporating several states, at comic book shops across the southeast and up north, I saw many places that sold IDW's Tank Girl but not Judge Dredd Megazine. Retailers had no idea, as per usual, that the character had new adventures here. Rebellion failed to promote it in any real way. If ever there was a time for full-page ads in the Previews catalog from Diamond Distributors, this was it. Another opportunity was lost. This would not improve for another couple of years. Oh, yeah, and the Meg was now bagged with a "free graphic novel," usually 64 pages and printed at the same dimensions as their line of reprint books. The "Meg Floppy," as it's often called, is still going today, four years later, and seems to serve the dual purpose of gauging reader response to material that might be served by the larger bookstore market, and also getting old material scanned in and resized for the reprint world. This format - 64 pages and bagged with a reprint - has been the standard for the Meg since issue 275. Next time, Tony Lee gets some hate mail. See you in seven days! 186. It's not who I thought it was! 184. Nobody saw this coming.